New Writing from the Royal Holloway Creative Writing Programme with a Foreword by Andrew Motion. Together with Jo Shapcott, Susanna Jones and Kate Williams, Andrew Motion has discovered and taught some of the most promising new voices to emerge in contemporary poetry and fiction. 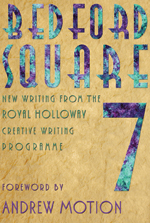 Startlingly original and varied, Bedford Square 7 showcases the latest poets and fiction writers to graduate from this prestigious creative writing course at Royal Holloway, University of London.